According to 6Wresearch, India LED Lighting market is projected to grow at a CAGR of 26.6% during 2017-23. The Government of India launched an initiative in 2016 to replace conventional lights by LED lights by deploying 770 million bulbs and 35 million street lights by 2019. Further, under DeenDayal Upadhyaya Gram Jyoti Yojana (DDUGJY), 273 lakhs LED bulbs have to be distributed to BPL households. Additionally, prices of LED lights are also expected to decline in the coming years, which would drive the growth of the market over the next six years. The northern region accounted for the largest revenue share in the country in the year 2015-16, followed by Southern region. The LED street lights installations are maximum in Southern region followed by Andhra Pradesh. Government of India distributed LED bulbs under the ‘UJALA' scheme with maximum number of bulbs distributed in Gujarat. • Historical Data of India Lighting Market Revenues for the Period 2014-2016. • Market Size & Forecast of India Lighting Market Revenues until 2023. • Historical Data of India LED Lighting Market Revenues for the Period 2014-2016. 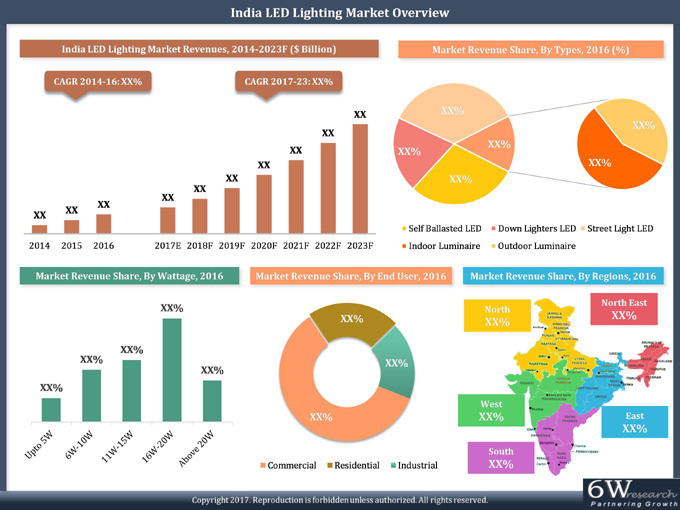 • Market Size & Forecast of India LED Lighting Market Revenues until 2023. • Historical Data of India LED Lighting Market Revenues by Types for the Period 2014-2016. • Market Size & Forecast of India LED Lighting Market Revenues by Types until 2023. • Historical Data of India LED Lighting Market Revenues by Applications for the Period 2014-2016. • Market Size & Forecast of India LED Lighting Market Revenues Applications until 2023. • Historical Data of India LED Lighting Market Revenues by End user for the Period 2014-2016. • Market Size & Forecast of India LED Lighting Market Revenues by End user until 2023. • Historical Data of India LED Lighting Market Revenues by Regions for the Period 2014-2016. • Market Size & Forecast of India LED Lighting Market Revenues by Regions until 2023.